When I was young I loved eating tacos topped with ketchup. As an adult I have discovered many other delicious Mexican recipes and I honestly can’t remember the last time I ate a regular taco. It has been a few weeks since I’ve made a “favorite meal” pizza, so tonight, taco pizza it is. There was a batch of cornmeal dough leftover from the deep-dish pizza, which is similar to the corn tortilla shells of my childhood tacos. On the dough, I slathered refried beans and layered seasoned and sautéed ground turkey and onions. As an adult, I realize how gross ketchup on tacos sounds, so for a sauce I used a mixture of Prego and salsa. I topped this giant taco with Mexican cheese and black olives. 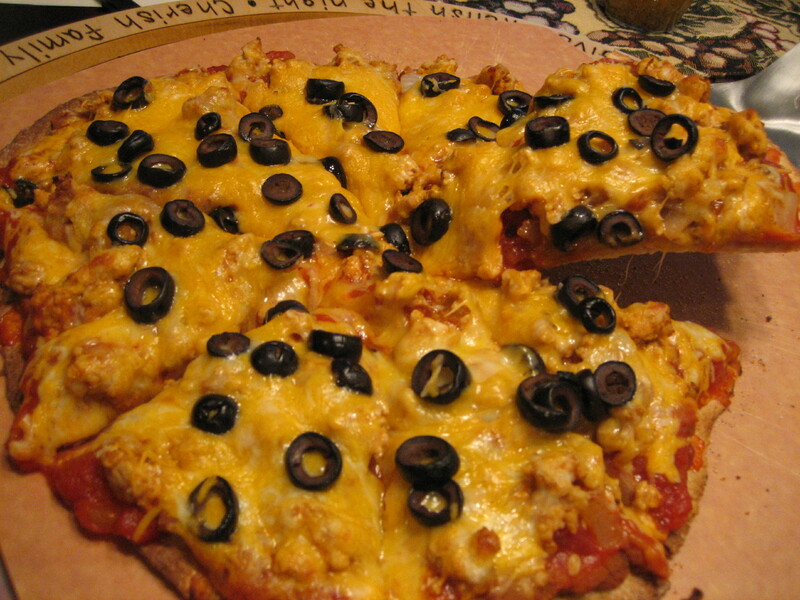 This taco pizza was piled high with great tasting toppings. It was hands-down the best taco I’ve ever eaten. This entry was posted in beans, cheese, Fruit, marinara, Meal->Pizza, meat, olives, Onion, salsa, sauce, turkey, veggie and tagged cheese, cornmeal, pizza, prego, taco, taco pizza recipe. Bookmark the permalink. Your pizzas all look really good! I would love for you guys to come out here and you can make us pizza. I’ll help! This is a great project! The taco pizza looks great! I found your blog on the Rochester pizza blog and have been enjoying the different posts. Keep up the good blogging! Thanks Karley, I will definitely keep the pizzas and blogs coming!! !